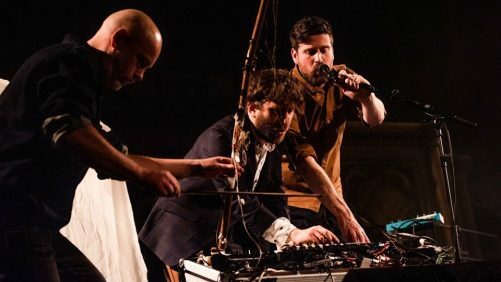 Scottish folk outfit Lau — the four time BBC Radio 2 Folk Awards winners comprised of fiddler Aidan O’Rourke, vocalist/guitarist Kris Drever and multi-instrumentalist Martin Green — have released a batch of new live sessions featuring material from their forthcoming album, Midnight and Closedown. Recorded live at Silk Mill Studios, the sessions capture the depth and intricacy of their critically-acclaimed new material, while exemplifying the strength of communication and musical understanding they have developed over more than ten years of live performance. Discussing the new album, which is released in CD, vinyl and digital forms this Friday, Aidan O’Rourke stated: ‘We wanted to make a Brexit album. What does that mean? The themes seemed vivid and swirling. Isolation. Fear. Giddiness. Cutting ties with allies, friends and partners. The vehemence of opinion. The shoutiness. The rise of the right. The allure of brashness in politics. The allure of romanticisation in the politics of Scotland: complicated, ever-shifting parameters of nationalism, nerves and optimism in the aftermath of the 2014 independence referendum. The sense that our collective future is hazy’. The album sees the band recording with John Parish, known for his work with PJ Harvey. The record has already been highlighted in Mojo magazine, with a four star review praising the band’s ‘Outrageous virtuosity, fearless musical ambition’, while highlighting the dark themes that ‘lurk between the delicate weaves of fiddle, guitar, accordion and computer’. The latter quote alludes to the electronic textures the band have subtly harnessed, which take little away from the organic warmth of their sound, while adding a precision and edge to it. You can preview every track from their forthcoming record here and pick up tickets for their return to the North of England here. The group play at The Grand in Lancaster on 16th February and Leeds’ City Varieties on 26th.